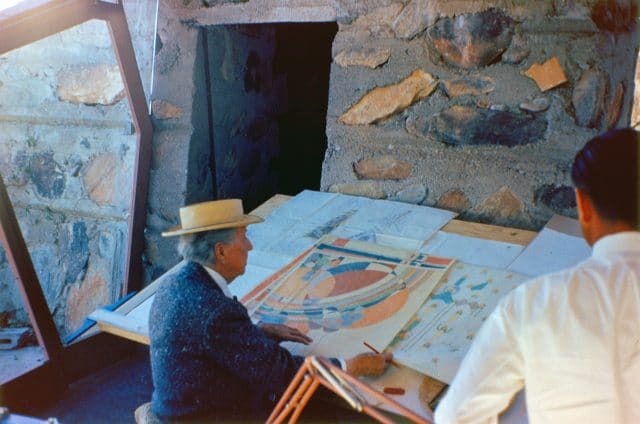 When one thinks of an architect, naturally one visualizes their most famous buildings - but, as much a part of that imaging process are the forms & shapes which you primarily associate with their work. 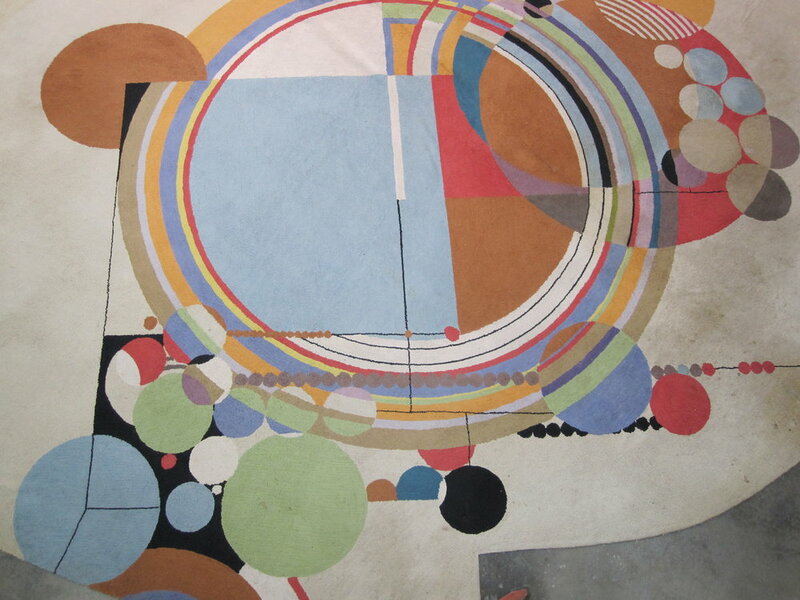 Thus, entrained with any thought of Wright, are the forms of his thrusting/cantilevered horizontal planes, counterpointed by solid masonry masses, his rhythmic verticals, and rigorous-but-playful use of circles. For Mies, it might be his floating, shifting planes (as in the Barcelona Pavilion), his cruciform column (from the same project), and his glazed grids. 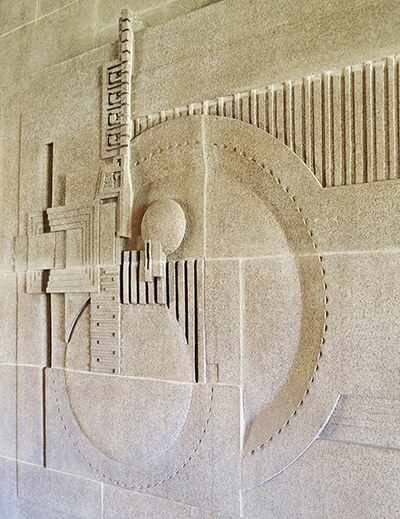 Corb is associated with a big vocabulary of forms—and strongly with his more sculptural shapes (like at Notre Dame du Haut) or, conversely, his platonically geometric “purism” (as in his Villa Stein or Villa Savoye). 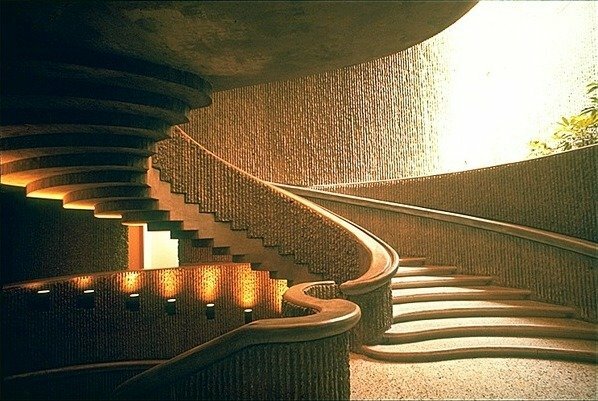 When it comes to forms, there’s something inherently pleasurable in curves and circles—one wonders if we, unconsciously, relate it to the pleasures and vitality of human bodies - or life itself. And it’s useful to recall that the education of all artists (and architects) - at least ‘till recently - included figure drawing. But what about circles in Rudolph’s work? 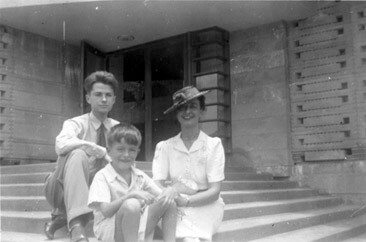 Rudolph (at left) and family members, visiting Wright’s Rosenbaum House in Alabama. "Architect Paul Rudolph intends to enliven one 180-mile stretch in the interior - between two of Florida’s most popular sights, Silver Springs and the Bok Tower - with an amusement center and tourist attraction where the main feature is Florida flora growing from earth materials supported by masses of floating roots commonly called ‘floating islands.’ The site has a 1000-foot frontage on two U.S. highways and easy access to a fresh water lake where fishing is excellent. Aimed primarily for sight-seers who want to stop for a couple of hours for food and rest to learn something fast about Florida flora, the center would provide a restaurant near the road for passing motorists as wells as those who stop to see the gardens. For entertainment and recreation there will be a variety of exotic floral displays, grandstand shows of swimming and diving, and boating and water skiing on the lagoon which leads to the large lake and then a string of lakes and canals for boat excursions." 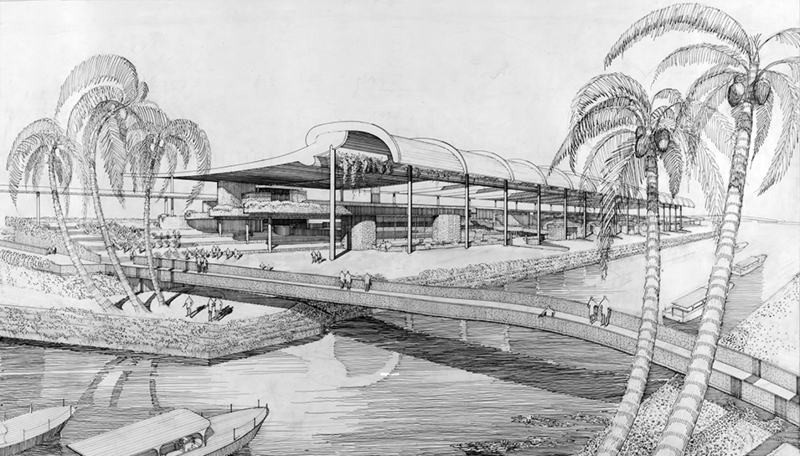 Now, looking at these Wright designs, and looking at Rudolph’s plan for the “Floating Islands” project, do you see some formal resonance? Maybe a lot? We do. Hmmmmm! Practical, budgetary, and programmatic challenges aside, one wonders what Rudolph thought (and felt! ), knowing that he was supplanting the great Master himself. These fine historians go on to venture that Rudolph, in his design, might have been referencing Wright’s work (and mention several formally pertinent projects of Wright’s.) 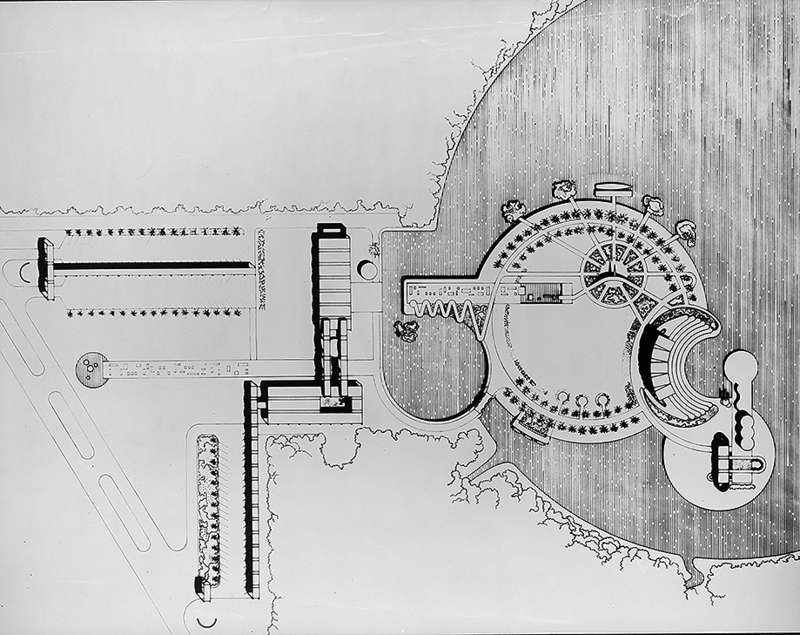 Or perhaps Wright’s original plan for this development was so strong, that Rudolph felt it provided a good and relevant parti for his own design? These are questions for which it is interesting to speculate - though they too have a circular quality. 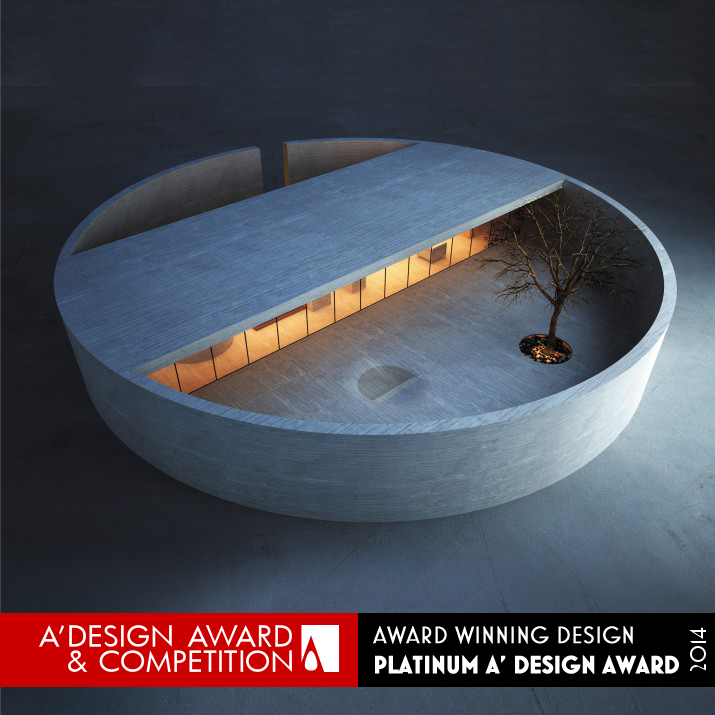 The renderings make it look like the house, the courtyards, and the perimeter wall are made of concrete—and, if that’s the intention, this is certainly one of the most serenely elegant uses of concrete we’ve ever come across. MZ has other renderings for this superbly composed project—and we suggest you visit their website to see them (as well as explore the rest of their interesting oeuvre). 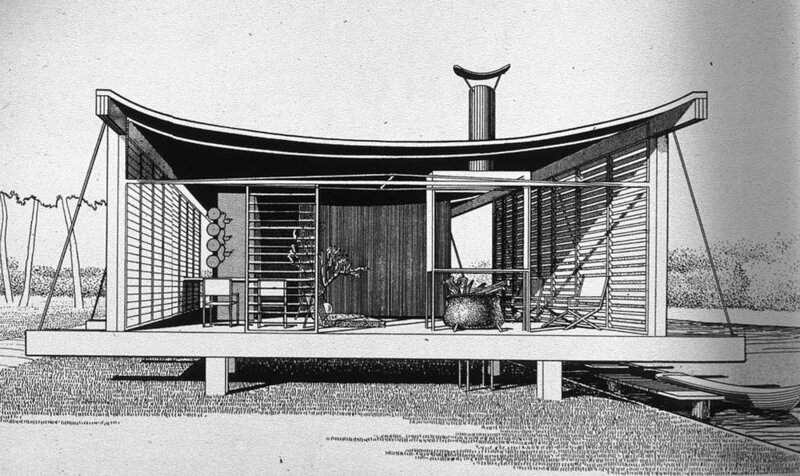 Like us, you are passionate about Paul Rudolph's life and legacy. Join our growing online community to stay informed and engaged with the Paul Rudolph Heritage Foundation. We respect your privacy. Your information will not be shared with other organizations.